Family fun at the Spooky Symphony! Conductor Hector Guzman and The Plano Symphony Orchestra will present “Spooky Symphony” at the Eisemann Center on Sunday, October 25th. Pre-concert activities will begin in the lobby at 2:15 pm, followed by the concert at 3 pm. Magician David Hira will join the orchestra in a magical illusions performance. The Plano Symphony Orchestra will feature music from Star Wars and Harry Potter, as well as Halloween favorites. This performance is wonderful for kids ages 3-12 and their families! Come out early to get a chance to interact with the Instrument Petting Zoo, Conductor’s Station, craft station and more. For less than the cost of a movie, both children and adults can enjoy a wonderful afternoon full of fun, learning and great music! Costumes are encouraged! 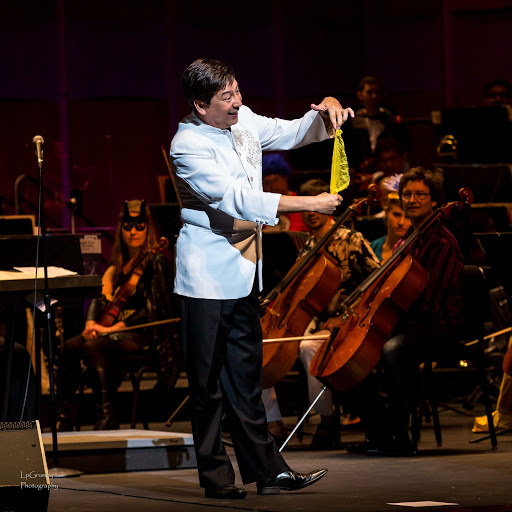 Magician David Hira has performed on cruise ships, at Caesar’s Palace in Las Vegas, has been on television 43 times and now is performing with the Plano Symphony! Come see David bring magical fun to this year’s Spooky Symphony as he makes things magically appear, disappear and even float in thin air! As the symphony plays, David’s mysterious haunted hanky “Casper” will prance and dance on stage and in the audience. Come be enchanted, mystified and delighted. For tickets, call the Plano Symphony Orchestra Ticket Office at 972-473-7262, or visit www.planosymphony.org to purchase tickets online. Reserved seating tickets start at $9. Tickets will be an additional $2 per ticket if purchased at the door. Group rates are available. The Plano Symphony Orchestra is a professional orchestra providing entertaining and engaging musical experiences to the North Texas area for over 32 years. The last nine seasons have been sold out. The “Spooky Symphony” concert will be at 3:00 pm at the Eisemann Center for the Performing Arts, located in Richardson at 2351 Performance Drive.